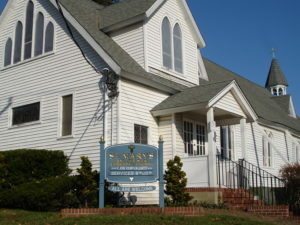 Throughout much of the year 2012, members of St. Mary’s by the Sea Episcopal Church in Point Pleasant Beach, NJ prepared for what they hoped would be a successful capital fundraising campaign. Important upgrades and repairs to the church were needed including exterior and interior ramps to make the building accessible. Also needed were extensive renovations to the rectory. On September 30, commitments were received and the campaign was underway. So much work had been accomplished in anticipation of funds being received and work being planned that the congregation felt a true sense of celebration. Little did they know some of their most challenging times lay just ahead. October 29 brought a direct hit upon Point Pleasant Beach by a most unwelcome guest named Hurricane Sandy. The town was devastated with property lost and lives changed forever. The church was only a couple blocks from where the wreckage pushed its way in from the shore. Many members’ homes were damaged and some lost everything. But this did not stop their reaction as the church of Jesus Christ. Members quickly went to work opening the church to those in need. Clothes were gathered for distribution. Meals were served, even delivered, to those taking up residence in local motels. For their efforts, they received national recognition. Even more amazingly, members did not forget their own capital campaign. Funds were gathered. Sweat equity was added. And what needed to be done was accomplished. The spirit of cooperation that began in an effort to repair a church and rectory overflowed to a community in crisis. In the end, both buildings and lives were touched and repaired by faithful servants. While members were reminded throughout the campaign that it is about much more than bricks and mortar, they had no idea how much their working together would be put to the test. The lessons they learned will never be forgotten inside and outside the walls of St. Mary’s.